You can map a 2D mouse position to a color by using the mouse position to map to the Hue and Saturation and then converting the HSV value to an RGB value. (We just use 1.0 as the Value component of HSV). We can map the mouse to a color wheel and use the angle of a line from the mouse position to the center of the wheel as the hue and use the distance from the center of the wheel as the saturation. 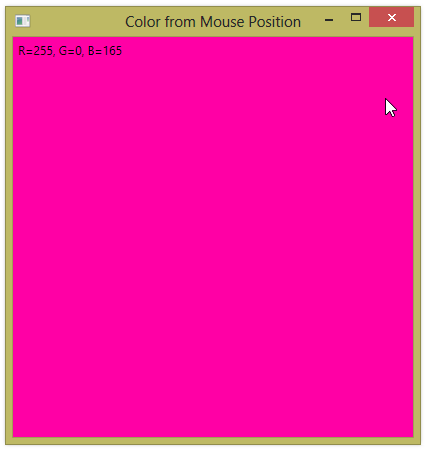 In WPF, we’ll just create a Canvas, with a Label that will be used to dump out the RGB values. 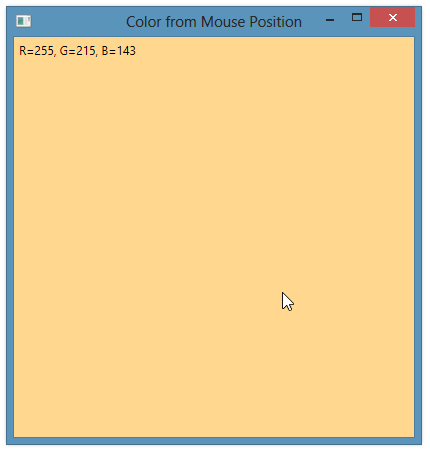 In the code-behind, we’ll handle the MouseMove event for the window and re-calculate the color of the window’s background brush, based on the mouse position. Notice that we make use of an HSV to RGB conversion function, found at http://www.splinter.com.au/converting-hsv-to-rgb-colour-using-c/. Below is the function as we’re using it. // Just in case we overshoot on our math by a little, we put these here. Since its a switch it won't slow us down at all to put these here. // The color is not defined, we should throw an error. The final result is a window whose background color changes as we move the mouse around. I have spend a lot of hours to get a running solution with a color picker in c# wpf. Is it possible to send you me project with your code which dont work properly? All of the code that I have is already posted on this site. The code worked fine when I wrote the post, so should work for you as a starting point. So perhaps you could post your code on Stack Overflow and get some assistance on whatever is not working.